When it comes to buying office furniture for your space, you are faced with a number of different options. While some will go the way of purchasing brand new office furniture, other will consider looking at used office furniture. Used office furniture can be just as reliable as new furniture and can save office management money, however there are some things to be aware of before you make your purchase. Used office furniture should be checked for previous damage. Don’t get discouraged by scratched and chips along the surface of the piece, these tend to be fixable through refinishing. However, serious damage like missing chunks of wood or necessary nails can be serious, so always check a piece thoroughly before making a purchase. You should also try to determine in what year the piece of furniture was made. Wood furniture that was created before the 1960s tends to be made with sturdy, natural wood, which holds up better than other pieces. Those made after the 60s tend to be made of particle board, which is worth less in value and has a lower quality. Instead of purchasing an entire set all at once, look around for different pieces that will match with each other. This will help cut down the cost of buying a full set while still creating a professional and appealing appearance for your office. 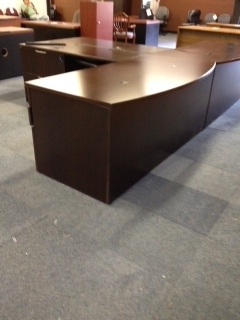 At Mark Downs Office Furniture, we specialize in used furniture for your new office space. Our trained professionals will be able to answer any of your questions and assist you in deciding on a piece of used furniture. Whether you are furnishing your home office or creating a new space for your staff, Mark Downs has the furniture to suit your needs and fit your style. This entry was posted on Friday, September 4th, 2015 at 5:15 pm. Both comments and pings are currently closed.